Q. If I select products from your online Shopping Cart, can I call the order in rather than placing it online? Q. Where else can I order or find out more about your products? Q. How do I know my personal information is secure? Q. Why am I being charged Sales Tax? I thought Internet sales were tax-exempt. Q. How do I pay for an order I place on a discoverytoys.com Shopping Cart? Q. What are my shipping and delivery choices? Q. Can I ship to an address outside of the US or Canada? Q. Can I split an order and send it to two different addresses? Q. How will I know that my order has been received and is being processed? Q. What if I need to return a product that I purchased through discoverytoys.com? Q. Will my Discovery Toys Educational Consultant receive sales credit/commission for my online order? Q. I still have questions; where do I go for answers? A. Absolutely. Dial 800-341-TOYS (8697) M-F 7:00 am – 5:00 pm (PT) if you're calling from the U.S. or Canada. Please have a credit card ready and provide the name of the Educational Consultant who owns the site so that she can get credit for your order. A. Your Educational Consultant will be happy to answer any questions you may have. They can set up a personal shopping appointment or assist you in hosting a party where you can earn free products and other hostess benefits by sharing with your friends. The Educational Consultant can also answer any questions about the product line, take your order, and even discuss the possibilities of starting your own business. Please feel free to call or E-mail your Educational Consultant using the contact information provided on her home page. A. We want you to know that your transaction at discoverytoys.com is both private and secure. We use secure sockets layer (SSL) to encrypt and protect information you send to us, ensuring that you are dealing with the legitimate, secure Discovery Toys server. You can be assured that placing your order through our Web site is as safe as placing your order by phone or by mail. Please feel comfortable shopping with Discovery Toys and enjoy your experience. More information is available in our Privacy Statement. A. Internet sales are not specifically exempt from sales & use taxes. Discovery Toys has activities in each state of the United States and each Canadian province that subject it to state, provincial and local laws imposing sales tax collection. Therefore, Discovery Toys is required to collect tax on merchandise sold via the Internet or otherwise. You may be interested to know that if a vendor does not charge sales tax, the purchaser of the merchandise is required individually to remit the tax to the taxing jurisdiction. The appropriate taxes (based on the "ship to" location) will be added to your order. This dollar amount will be reflected on your Order Summary screen. Shopping Cart cannot accommodate purchases made by a tax exempt organization. Please contact your Educational Consultant to place these orders. In the United States, State and local sales taxes are based on the subtotal after delivery charges (shipping and handling) in all states charging sales tax with the exception of IA, ID, LA, MA, OK, UT and WY where tax is based on the merchandise total only. A. American Express, VISA, MasterCard, and Discover Card (USA only) credit cards are accepted as payment for orders placed online. Debit or ATM cards with a credit card company logo, such as VISA and MasterCard are also accepted. Note: to avoid delay, please verify the Billing Address is correct for the credit card used. A. 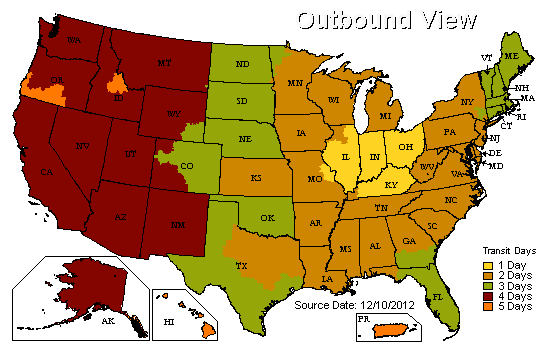 In the United States, we ship via common carrier ground from our Distribution Center in Indiana (FOB shipping point). For an additional charge, we also offer 2nd Day Air or Next Day Air Delivery in the contiguous U.S for orders shipping direct to the customer . Shipments to Hawaii, Alaska, all U.S. Territories and Post Office boxes are sent via USPS (United States Postal Service). All deliveries are based on business days, and do not include weekends or holidays. Click here for U.S. ground delivery transit time information. Standard Ground delivery times within the contiguous United States average 2-4 business days from the time your order ships (please allow for 3 to 4 days in-house processing time.) Delivery can vary depending on the destination address. A. In Canada, we ship via common carrier ground from our Distribution Center in Indiana (FOB shipping point). For an additional charge, you can contact Discovery Toys at 800-341-8697 for 2nd Day Air charges for delivery to AB, BC, MB, ON, QC and SK. Please allow 3 to 4 days processing time. Please note we do not ship to a P.O. Box. A. Currently a Canadian resident may only ship within Canada; a U.S. customer may ship only to a U.S. address or an address within a U.S. territory. APO/FPO orders must be placed by contacting your Educational Consultant directly and not through their shopping cart. A. At this time, we are unable to split an order for shipping to different addresses. However, you may submit multiple orders. A. You'll receive an order acknowledgment by E-mail once it's received. Orders leave our Distribution Center in Indiana within 3 to 4 days of receipt. You will also receive a shipping confirmation email with tracking information once your order is shipped. Your Educational Consultant can assist you if you have specific questions or concerns about your order. A. Any defective Discovery Toys product will be replaced at absolutely no cost to you. Our product warranty applies to manufacturer's defects and excludes damage due to misuse or mishandling. In addition, Discovery Toys backs every product with an unconditional satisfaction guarantee. Contact your Educational Consultant, whose information is listed on your packslip, for additional information. A. Yes, your Educational Consultant will receive sales credit/commission for this order directly from Discovery Toys. This does not affect the total purchase cost of your order. Your cost remains the same. It is very important that you shop on the site of the Educational Consultant who you are working with in order for her/him to receive credit for the sale of an order.